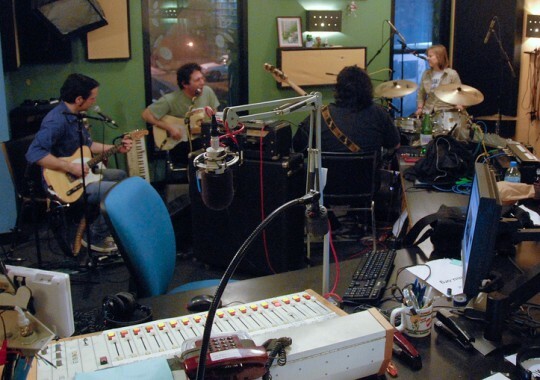 It’s that time of year again: Yo La Tengo will be taking to the radio waves tonight, playing requests (including, perhaps, “Radio Waves”) in exchange for pledges of cash money to America’s premiere freeform radio station, WFMU. Join Ira, Georgia, James, Bruce Bennett and hosts Pseu Braun & Gaylord Fields tonight from 9PM to midnight EST at wfmu.org or on your radio dial at 91.1FM. Highlights IMHO: Tall Dwarfs – Crush; The Marvelettes – Please Mr. Postman; Misfits – Hybrid Moments; Derek and the Dominoes – Layla (instrumental); Nick Lowe – Marie Provost (Gaylord Fields on vocals); Velvet Underground – Sweet Jane. One correction: Although The Searchers did record a version of “Farmer John,” the seminal version (which appears on Lenny Kaye’s original Nuggets comp) was recorded by the Premiers. It was also recorded by Neil Young and by Don & Dewey. I am delighted and honored that Ira Kaplan gave a close enough reading to my transcription that he offered this gentle correction. here’s hoping that next year your tim dog request gets filled, gerard. ken: the seminal recording of “i’m your puppet” was done by james and bobby purify in 1966, and it was subsequently recorded by sam and dave the next eyar. the ylt version sounds pretty faithful to the purify version. there is a dan penn recording from 1994, but it was most closely associated with the purifys despite the fact that they didn’t write it. and the layla “instrumental” is really just the coda, which was co-written by jim gordon. Thank you baconfat! In all honesty, I only knew the YLT recording (and the songwriting credit on its label). One more correction: Bruce Bennett told me that the track “A-Bomb Bomp” (in the seventh set) which I attributed to The A-Bones was actually a cover of a song originally recorded by Mike Fern.